In spite of the looming storm clouds we headed off to the Rock Furnace Trail late Saturday afternoon for a three mile hike. We expected that the trillium that was just getting started last week would be in its full glory, and we were not disappointed! Also, so many friends have been telling us about arriving migrant bird species (including Lynn Ramage with a “birding trifecta” at her feeder one morning – indigo buntings, scarlet tanagers, and rose-breasted grosbeaks – Patrick Kopnicky with his first hummingbird of the season, and the Harrison Hills Bird Walk with Paul Hess turning up 55 species including 9 species of warblers and a great collection of vireos, flycatchers, orioles and tanagers). We were hoping to see some new birds, and we were not disappointed in that either. Rock Furnace is a great place for the large-flowered trillium (Trillium grandiflorum ). Maybe it is the neutral soil pH or the stable, established deciduous tree cover, or maybe it is the steep slopes of the ravine that keep deer from too heavily cropping back the plants. Or, maybe this area has great populations of ants to disperse the trillium seeds! Possibly all of these factors come into play to make this ravine one of the finest places in the state to see this flower! 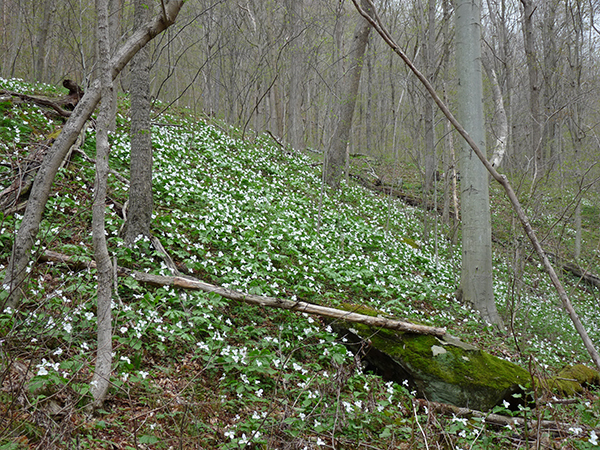 There were small patches of this white trillium almost immediately, but about a mile along the trail the ravine slope on the opposite side of the stream was carpeted with blooms (photo by D. Sillman). It was breathtaking! We walked to the junction of Roaring Run creek with the Kiski River and then turned to go back up the Rock Furnace Trail. About a quarter of a mile along the trail I saw a flash of blue up in some of the still bare-branched white ash and red oak trees along the trail. Thinking it was a indigo bunting or black-throated blue warbler, I re-positioned myself on the trail so that I could more easily see into the thicket of branches. Whatever had been blue quickly vanished, though. 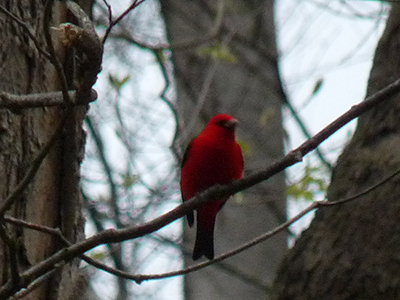 Actually, he might have been there but my attention was diverted to two, bright red, male scarlet tanagers that were (quite peacefully) sharing a branch up in an ash tree (photo of one the tanagers by D. Sillman) . These two male tanagers looked like they had just arrived from their long migration from their over-wintering sites in the foothills of the Andes in northern South America. They had spent the winter in large, mixed species flocks of flycatchers and some resident tanager species and migrated in stages first across the Gulf of Mexico and then steadily northward across the eastern United States. Very soon, though, the camaraderie of winter and migration flocking would give way to the ego-centrism of claiming a mating territory. Each male scarlet tanager needs exclusive license to 25 to 30 acres of un-fragmented woodland around its nesting site to have a chance at successful reproduction. Think of all of the insects they will have to consume to fuel the growth and development of their brood of young! The female tanagers will arrive in a week or two. By then the males will have divided up the forest into their individual spheres of influence and will concentrate on impressing a female with their energy and vigor. The female tanager after she selects a male makes a loosely constructed, cavity-shaped nest out of twigs, rootlets, weed stems, and grasses. She then lines the nest with pine needles and fine grass. Nests are typically located in trees twenty to forty feet above ground level although some nests have been observed over a broader range of four to seventy-five feet above the ground. Eggs are typically laid from mid-May to mid-June. These eggs are a pale blue-green with brown speckles and are laid in clutches of four or five. The eggs are incubated for 13 to 14 days by the female. The young remain in the nest for 9 to 11 days after hatching and are brooded by the female but fed by both parents. There is only one brood per year for this species. Cowbirds are well known to deposit their eggs into tanager nests much to the detriment of the survival of the tanager nestlings. Right after we saw the tanagers it started to rain. The rain was then punctuated by lightning and thunder. The lightning and thunder, then, in response to Rob Bridge’s comment “that it could be worse,” was in itself punctuated by hail. We got completely soaked in our run back to the cars. Around the yard: my apple trees are in flower, my scarlet oaks are leafing out, and the garlic mustard is flowering (not all events are welcome!). And, on Sunday evening, “Hubert” (our ruby-throated hummingbird of the past three summers) showed up at our nectar feeder! Spring is happening faster than I can watch!